If you’re a parent, Halloween can be an unsettling mix of emotions. 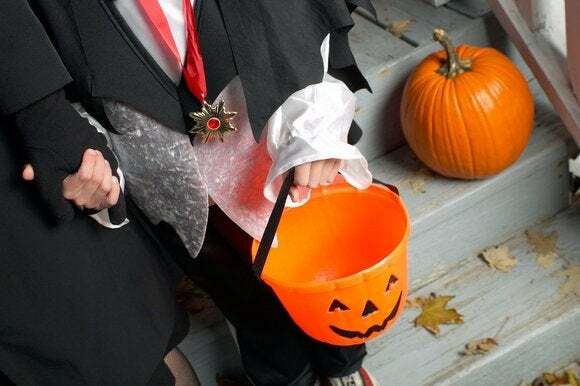 Sure, your kids are having a great time roaming the neighborhood and stuffing themselves with candy, but being a parent you’re of course worried about their safety, especially if this is the first Halloween that you’re letting your kids trick-or-treat unsupervised. Use your iPhone to put your mind at ease on All Hallow’s Eve with this collection of apps that can track a group of family members—even if they’re using Android devices—and apps that help light the way. 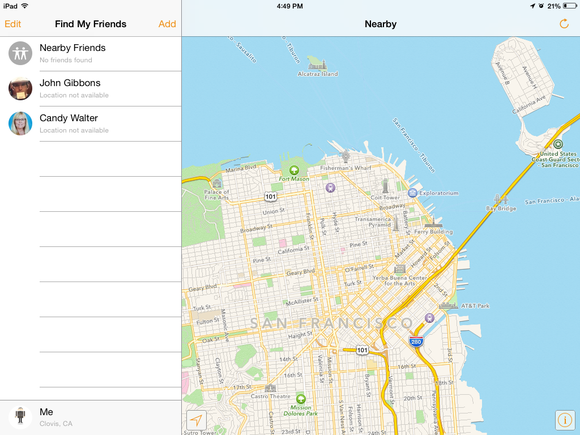 Find My Friends is the best location-tracker if everyone has an Apple device. Find My Friends (free) is already on your iPhone, and it’s the best way to keep tabs on each family member’s location in real time (assuming they all use an iPhone, of course). To start using it, you’ll first need to activate it within iCloud. Go to Settings > iCloud, and scroll down to Share My Location; tap it, and toggle location sharing on. Next, you’ll go back to the Find My Friends app and sign in with your Apple ID. From there, you can then invite others to share their locations with you; since we’re talking about your children, here, you can manually set it up on their phones and accept the invite. Then anyone in the group can launch Find My Friends to see where others are currently located. If you’re new to Find My Friends, there’s much more you can do besides tracking. You can tap on a contact to send them a Message, start a FaceTime chat, or call them. For putting your mind at ease, you can opt to get a notification when they leave or arrive at a specific location—like when your child arrives at their friend’s house—which means you don’t have to obsessively check the app or text your kid. A bonus for parents: You can use Restrictions—Apple’s term for parental controls—to ensure that your kids can’t turn Find My Friends off. On your child’s phone, go to Settings > General > Restrictions, then tap Enable Restrictions to set up a password-protected set of parental controls. Use Life 360 to get updated on where everyone is, regardless of which device they’re using. As much as you love your iPhone, your teenager may have opted for an Android device (or perhaps they inherited one of your old Android hand-me-downs). 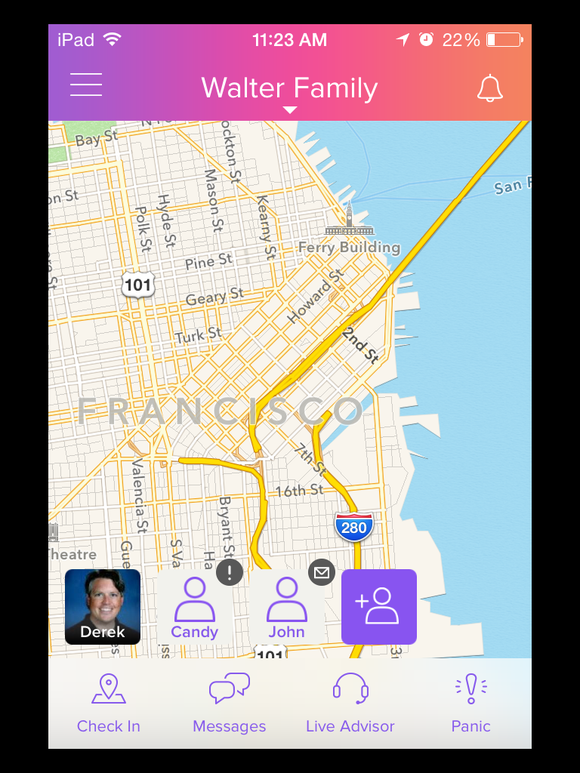 Not to worry—check out Life360 (free), which works much like Find My Friends, but is cross-platform for those multi-operating system families. To get started, you’ll need to create an account and get everyone else in the family to download the app on their own devices. Then, one person needs to invite the others to share locations with one another. Life360 goes beyond Find My Friends in terms of additional features: for example, family members can message one another and also get nearby crime alerts. You can also set up different circles of friends or family members to better categorize who you’re keeping tabs on. Life360 may help you make better route choices when heading out on Halloween thanks to its specific pinpoints of crime activity. There’s also a premium option—$5 per month or $50 per year—that offers around-the-clock customer service, which includes help with location tracking and finding roadside assistance. 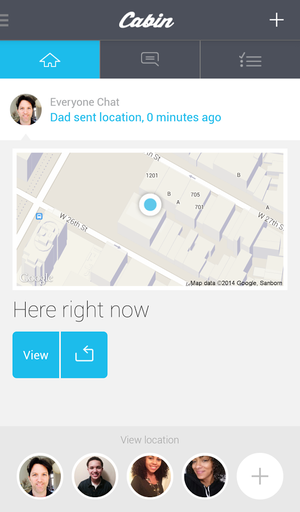 Cabin can track your whole family - whether or not they use an iPhone. 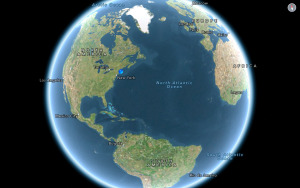 Cabin (free) is another solid, cross-platform friend-and-family locater. You can message others in your “cabin” (see what they did there?) directly from the app, which can be faster than creating a new group Message or SMS. You can also assign tasks, which is a great way to nag your children about getting home on time. If you set up an account and designate yourself as the group admin, then you’ll have access to additional features—you can delete users from the group or freeze their access to the in-app family. You’ll also get a little extra info when you look at someone’s location, such as an exact calculation of how far away they are and an icon indicating their phone’s battery level—so that “I’m sorry I didn’t text you back, my phone died!” excuse just isn’t going to fly anymore. You can pinch-to-zoom to hone in closer on their location and tap their icon to quickly send a message from Cabin. Your trick-or-treater can send a “Glympse” of their location for a specified time period. If you don’t want to sign up for another online account, but you do want to know where everyone is on Halloween, then go with Glympse (free). It’s perfect for one-time use, as anyone who grabs the app can share their whereabouts for a specified length of time—anywhere from four hours to 15 minutes. It then expires afterwards, which is good for sharing your location with a friend—or your child’s friend’s parent who you need to communicate with on Halloween, but don’t want to have unlimited access to your child’s location after that. Glympse actually built a separate app specifically for Halloween night called Track n Treat (free). It’s really just a streamlined version of Glympse that lets you quickly broadcast your location to others, but with a Halloween twist. Glympse also recommends you use the app to let your neighbors know that your kid is out and about, so they can help keep an eye out in case of an emergency. Turn your iPhone into a virtual glow stick. Glow sticks are a Halloween tradition—there’s nothing like a quirky neon light to cut through the darkness. GlowStickGo (free) is a clever app that turns your iPhone into, well, a glow stick of sorts. You can shake your phone to get that blur of color you would with a real one—just be careful not to send it flying across the street. It won’t replace a proper flashlight, but brings some Halloween fun in a phone-sized package. 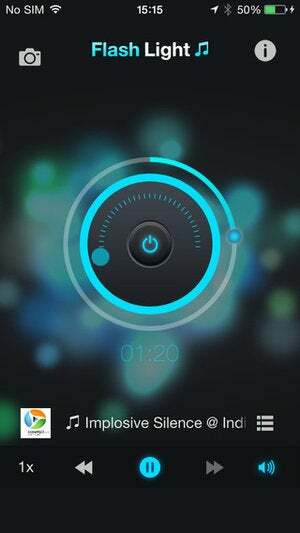 Get the party going with this strobe light app. Apple has its own flashlight component for iOS devices running iOS 7 or later: just swipe up from the bottom of the screen to launch Control Center to find it. Unfortunately, this addition rendered the myriad number of third-party flashlight apps obsolete, but some still offer more oomph than Apple’s stock offering. Consider Flashlight Strobe (free). It offers several different types of light patterns, such as a fluttering disco light, a flashing strobe, or a video player mode that sets the light to music. You also can just use it like a regular flashlight, lighting up your path with torch mode. The app is free, with a $1 option to remove ads.